Bioderma is one of the most raved about items in the beauty blogging world at the moment. 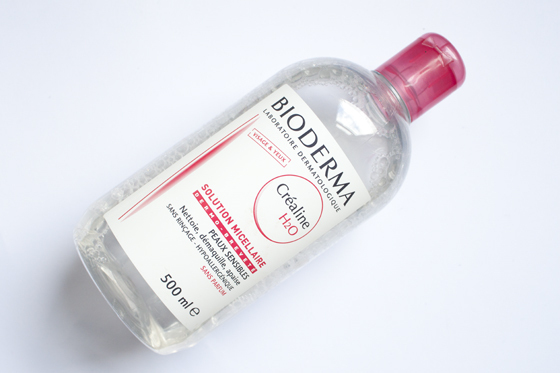 Bioderma has the consistency of water and is a completely odourless cleansing and makeup removing solution. It's not greasy, sticky or oily, and the solution completely dissolves all traces of makeup. 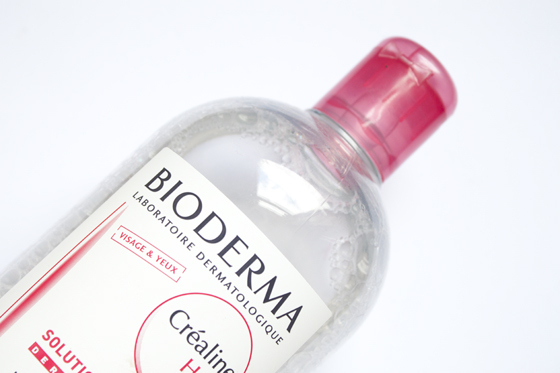 Bioderma isn't available in the UK but is very widely available in French Pharmacies. You can buy it online from various places including ebay. Bioderma removes every trace of makeup without leaving any residue. My eyes are very sensitive; Therefore, I try to avoid harsh makeup removers. I've had no trouble with Bioderma H2O as it's so gentle on the eyes. It only takes a few wipes to remove all of my eye makeup including my waterproof mascaras. I tend to use this on my eyes with cotton pads and then use a makeup wipe to get the makeup off the rest of my face. It works just as well as removing makeup off your face as the eyes. I just prefer personally just use it exclusively as an eye makeup remover. I can't say I'm actually fussed about this product. I do think it is one of the best makeup removers I've ever tried, but other eye makeup removers I've used to the same job for a fraction of the price that I can pop to Boots and buy when I need it. I doubt I'll go out of my way to get another bottle, unless I went to France or knew someone who was. I think the main reason I'm put off Bioderma is the fact you can't get it in the UK. There has been an influx of French Skincare in UK beauty market recently and Im surprised this hasn't been brought over. There are a few Micellar Water cleansers that are available in Boots for example La Roche-Posay Physiological Micellar Solution or Vichy Pureté Thermale Solution Micellaire Make-Up Removal Micellar Water, which might be easier to get hold of. While I do like Bioderma and it does live up to everyones claims, including being one of the best makeup removers around. Its availability bothers me and I'm much more inclined to purchase makeup remover on a whim in boots or when Im at the supermarket than buy it online or get someone to pick it up for me. It might be worth trying out, but overall I won't be repurchasing (unless I'm in France)! I love that product, it's so easy to remove make up with it (I really don't like that activity, but with this water it's quite nice). It also helps me with my problematic skin. In Poland Bioderma is much cheaper. :) Now I use Bourjois Micellar Cleansing Water, which is also good (and really cheap), but I think Bioderma is better. I love this stuff and it's actually cheaper than the one I was using before it. It comes in a huge bottle too that lasts forever. I can't stand oil based ones that make you feel all slimy afterwards - yuk! im so looking fwd to try this product! Even though it sounds brill, I don't think I'd ever bother ordering this online for such a pumped up price but as I'm off to France this summer I will definitely pick up a couple of bottles and try it out! i love this for eye makeup remover too! its so good with my waterproof mascara! I actually just got a sample size bottle in one of the beauty boxes over here, havn't tried it yet though!